Great Bear were recently approached by the Courtyard Music Group to help them complete the 100% analogue re-issue of their 1974 acid-folk album Just Our Way of Saying Hello. Among Britfolk enthusiasts, news of the Courtyard Music Group’s plans to re-issue their album has been greeted with excitement and anticipation. 100 copies of the album were made in a private pressing, originally intended for family and friends. After a hugely successful pledge music campaign, the band are pushing ahead with their re-issue project that will produce a limited pressing of the mono vinyl, a remastered audio CD with outtakes and a 48 page booklet with interviews, photos and drawings. These will all be available in the summer of 2015. Great Bear’s role in the project was twofold: first to restore the physical condition of tapes in order to achieve the best quality transfer. 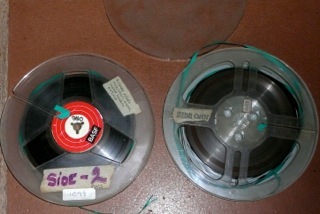 Second to produce analogue copies of the original master tapes. These second generation masters, originally recorded at a speed of 7½ inches per second, were transferred at the speed of 15 ips in our studio. These copies were then sent to Timmion Records in Finland to complete the final, analogue only cutting of the re-issue. Even amid the much discussed ‘vinyl revival‘ there are currently no UK-based studios that do pure analogue reproductions. The risk of losing precious cargo in transit to Finland was too great, hence our involvement at the copying stage. Why was it so important to members of the Courtyard Music Group to have an analogue only release? Digital techniques began creeping into the production of audio recordings from the late 1970s onwards, to the situation today where most studios and music makers work in an exclusively digital environment. Can anyone really tell the difference between an analogue and digital recording, or even a recording that has been subject to a tiny bit of ‘digital interference’? Frank Swales, member of the Courtyard Music Group, explains how remaining true to analogue was primarily a preference for authenticity. The ability to create exact copies is perilously difficult to achieve in an analogue context. Even in the most controlled circumstances analogue transfers are always different from their ‘original.’ The tape might distort at high frequencies for example, or subtle noise will be created as the tape moves through the transport mechanism. Yet the desire for analogue authenticity is not the same as wanting a replica. It is about preserving historically specific sound production process whose audible traces are becoming far less discernible. For a range of audiovisual objects made in the late 20th and early 21st centuries, such fidelity to the recording and its context will be increasingly difficult to realise. As appropriate playback machines and recordable media become increasingly difficult to source, an acceptance of hybridity over purity may well be necessary if a whole range of recordings are to be heard at all. We are not yet at that stage, thankfully, and Great Bear are delighted to have played a part in helping spread the analogue purity just that little bit further. This entry was posted on Monday, May 18th, 2015 at 1:39 pm	and is filed under Audio Tape. You can follow any responses to this entry through the RSS 2.0 feed. You can leave a response, or trackback from your own site.